First Nations share a desire to preserve cultural heritage by creating their own museums, libraries and archives as a bridge between the past, present, and future. It has always been important for the First Nations people to pass on the knowledge and practices of their ancestors for the next generations to enjoy. First Nations people have always preserved and protected their traditional knowledge, history and culture in many forms such as storytelling, artwork, and more recently with the introduction of modern technology: picture images, sound recordings and video format. 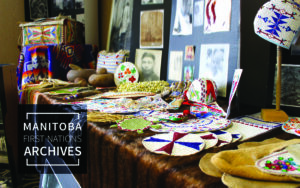 The Manitoba First Nations Archives (MFNA) will be a place for collections management of First Nations artifacts, traditional knowledge, and cultural items of value. It will be a central facility to showcase these items and also to inspire and encourage other First Nations to collect their own items of historical and cultural value. To preserve, protect and promote First Nations traditional ways of life, culture and history in a First Nations archives governed by First Nations. To establish a central, recognized place that will house items of archival value to the First Nations people of Manitoba. To inspire First Nations to establish their own local archives to preserve their history for future generations. As First Nations people we share and pass on our stories, customs, songs, dances and ways of thinking, doing, and being—as given expression through the First Nations languages. We value these forms of expression; they must be preserved as they sustain the lives of the individual, the family and the community. It is imperative that these stories, records and events linking the future generations of people with all that came before be shared and showcased.